by a friend who received it from a friend. I wanted to share it with you as well. It all began because my husband Mike hated Christmas - Oh, not the true meaning of Christmas, but the commercial aspects of it - overspending, the frantic running around at the last minute, the gifts given in desperation because you could not think of anything else. Knowing he felt this way, I decided one year to bypass the usual shirts, sweaters, ties and so forth. The inspiration came in an unusual way. Our son, who was 12 that year, was wrestling at the junior level at the school he attended. Shortly before Christmas, there was a non-league match against a team sponsored by an inner-city church. These youngsters dressed in sneakers so ragged that shoestrings seemed to be the only thing holding them together. As the match began, I was alarmed to see the other team was wrestling without headgear, a kind of light helmet designed to protect a wrestler's ears. We took every weight class. Mike, seated beside me, shook his head sadly, I wish just one of them could have won, he said. They have a lot of potential, but losing like this could take the heart right out of them. That's when the idea for his present came. That afternoon, I went to a local sporting goods store and bought an assortment of wrestling headgear and shoes and sent them anonymously to the inner-city church. On Christmas Eve, I placed the envelope on the tree, the note inside telling Mike what I had done and that this was his gift from me. His smile was the brightest things about Christmas that year and in succeeding years. For each Christmas, I followed the tradition. As the children grew, the toys gave way to more practical presents, but the envelope never lost its allure. The story doesn't end there. You see, we lost Mike last year due to dreaded cancer. 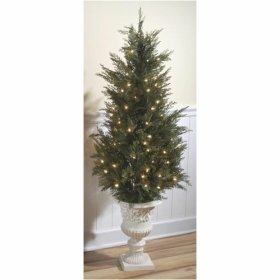 When Christmas rolled around I was still so wrapped in grief that I barely got the tree up. But Christmas Eve found me placing an envelope on the tree, and in the morning, it was joined by three more. Sarah McLachlan's voice has never sounded as dreamy as on this compilation, infused with delicate winter melodies of comforting warmth. Her new take on "What Child is This" is surprisingly refreshing and she gives new appeal to many classic renditions to capture your awareness of the intrinsic beauty contained in each song. "River" is filled with romantic longing and desires for simpler times..."I wish I had a river I could skate away on..." This song brings out the ecstasy in Sarah's voice. The blending of modern and classic songs works fairly well because Sarah maintains the mood with soft soothing vocals and highlights of music that never overwhelm the mood. 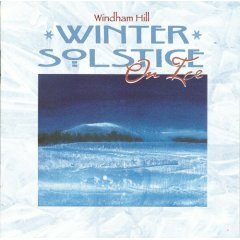 "In a Bleak Mid Winter" has acoustic elements and lyrics setting a modern yet romantic mood. The final track is breathless and compliments all the elements of this album as the mood is set for listening to this again and again. The entire album makes you want to get out some eggnog cookies and apple cider and read a cozy novel or write Christmas cards. A winter candle may be essential...a fireplace or fireplace DVD...most definitely! The first time I noticed the album cover, I was completely intrigued with the distant snow-capped mountains and invitation into a cozy magical tent, you might just happen upon in a magical forest. The music was worth the wait, with moments that delivers on the promise of mystery. Once you enter the mood, it remains consistent throughout and can create a world in which to relax or escape. For Love shall still be lord of all"
Till you come to me." This track is followed by a purely instrumental "Kecharitomene" with ancient echoes and Celtic worlds mingling as one in an enchanting fusion. The songs have a sacred quality enhanced greatly by the soft beauty in Loreena McKennitt's voice. The instrumentation throughout is of rare beauty with "Beneath A Phrygian Sky" capturing the very heart of the muse. 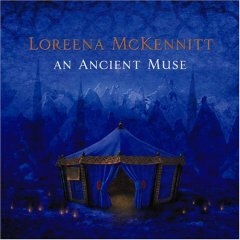 The entire album is not only a mesmerizing listening experience; it is an escape into mystery where Loreena McKennitt whispers your soul awake. From the crystalline textures of "Yesterday's Rain" to the edgy acoustic guitar in "What Child Is This," this album retains a Christmas mood, while taking you occasionally into a medieval forest. The second disc has a few more energetic selections with a bouncy "This Christmas" and then a mellow and comforting "Christmas Wish." "The Gift" is melancholy in mood, but a beautiful love duet that is hopeful and moody. "I Wish I Could" continues the melancholy mood and then funky jazz appears to break the mood and send you into mellow smooth starscapes. "Esawayo" displays some beautiful instrumentation with vocals from a land far away. Samite also appears again with "Stars to Shine." Both songs had me looking for more of his music.